Former Vice President Joseph Biden recently called Michelle Obama “the greatest First Lady in U.S. history,” and it is easy to see why. 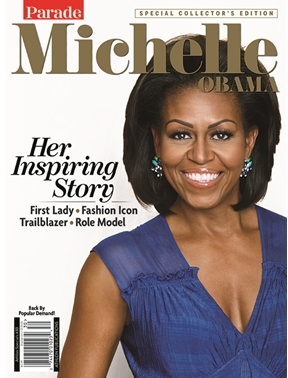 Married to the 44th President of the United States, Barack Obama, this multi-dimensional lawyer, writer, and mother of two, was not only the first African-American First Lady, but also a fashion icon, a role model for women and an advocate for poverty awareness, nutrition, physical activity and healthy eating. In this compelling and beautifully illustrated 100-page special, AMG/Parade will trace Michelle’s early life in Chicago’s South Shore community, to her years at Princeton and Harvard Law, culminating with her courtship with Barack as they climbed the ladder of political success. A special emphasis will be placed on her eight years in the White House, highlighting her numerous charitable works, her show-stopping speeches and the outfits that made her one of the most admired women in modern times.